In this installment of the ever present Power Rangers programming, the Rangers are in a realm that is comprised not only of their popular home town of San Angeles. Within this series, the Rangers would fight the forces of evil all around the world, and even in some fictional locations like Atlantis. This is one of the few series that would feature the leader of the Rangers, the Red Ranger, as someone other than a human. In this particular series, Mackenzie (Mack) Hartford is this Ranger, but throughout the series the audience learns that he is mostly android. He has superhuman strength as his power granted through becoming a Ranger. The other Rangers have skill sets that were enhanced from their own presumed abilities from their occupations or hobbies before dawning the uniform. The Black Ranger was a spy, and his enhanced powers related to his sight and his hearing. The Blue Ranger was a stunt man, and with his enhanced powers could leap incredible distances. The Yellow Ranger was a stock car racer whose enhanced ability would be super speed. The Pink Ranger is a genius, offering much information about fictional goals and mythological histories, and her primary power is invisibility. The primary evil that these Rangers were set to fight were two banished brothers from the time of the magic gems that gave the Rangers their powers. Their names are Flurious and Moltor. While they begin trying to work together to get the crown and its ultimate power, complete with the gems, they soon became enemies. Other enemies would also work against the Rangers and their goals, and manage to put up resistance in one form or another each and every episode of the series. The Rangers sought to complete the Corona Aurora, by finding all of the gems that fit into it and keeping them from the greedy hands of the power hungry foes that seemed to be ever present. Many of these would be contained within or related to mythological items like Thor's hammer or the Sword of Neptune. Determined to locate the jewels of the Corona Aurora, the Rangers use Mack's memory to reflect on their previous missions in an attempt to make sense of which jewel belongs to each faction. The Fearcats unleash the power of the Octavian Chalice, Tyzonn is injured in battle and awakens on his home planet. The Rangers travel to Egypt in search of the next Jewel, following a vital clue left by The Centurion Torch. Tyzonn and Rose face the obstacles presented by a forcefield that is surrounding them. Will resigns from the Rangers after he loses a valuable jewel. Moltor places the care of the Paedra Aztec Del Compass on the shoulders of his old ally Blothgarr, who uses its powers to affect Mac's chi, disrupting his fortunes in battle and in his social life. His teammates bestow upon him endless trinkets of their own good luck, but are they enough to repel Blothgarr and the compass? Will takes Tyzonn under his wing, eager to adapt him to Earth's customs, but Tyzonn begins imitating Will's mannerisms and attitude. Meanwhile, Moltor makes a bid for Mjolnir, the hammer of the Norse God of Thunder, Thor, prompting the Rangers to challenge him for it's possession. The Rangers fight to restore the liquefied Tyzonn to his physical state as the Fearcats ally with Flurious and gain even deadlier powers. Will a new Ranger be the only hope for the city and the world? The Rangers face off against Moltor in a bid to claim the second jewel, whilst a secret harbored by Tyzonn is revealed when the jewel's power is unleashed. Mack befriends a formerly peaceful alien who shamed his world by surrendering to Moltor. Now bound to do his bidding, the alien, Tyzonne, steals part of a vital parchment that will lead Moltor to the second jewel of the Corona Aurora, but Mack is able to tear off a vital piece, giving both parties part of a larger puzzle. Will is caught illegally selling Zord technology and is released from the team by Hartford. Taking his morpher with him, the professional thief decides to bat for the other team and sides with Miratrix, who is on the verge of releasing her master Kamdor. Can Will stoop as low as to help in the downfall of his former fellow Rangers? The Rangers travel to the island of St. Lucia in search of the first Jewel, and come across the specter of the pirate Brownbeard, who is searching the oceans for a valuable item, the Eye of the Sea. As The Rangers battle the scheming Miratix, Rose is possessed by the sea-faring specter, and becomes the adventurous "Rosie The Bold"
Two rival brothers, Flurious and Moltor, are transformed into hideous monsters and imprisoned on distant planets when they attempt to steal the Corona Aurora, the crown of the gods, for their own insidious use. Many years later, explorer and billionaire Andrew Hartford discovers the crown, but unleashes the two evil beings, who begin their return to Earth. Now Hartford must assemble a team of five to combat the brother's amassing forces and recover the five jewels of the crown before they do. 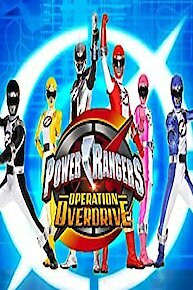 Power Rangers Operation Overdrive is currently available to watch and stream on Saban. You can also buy, rent Power Rangers Operation Overdrive on demand at Netflix, Amazon, iTunes online.